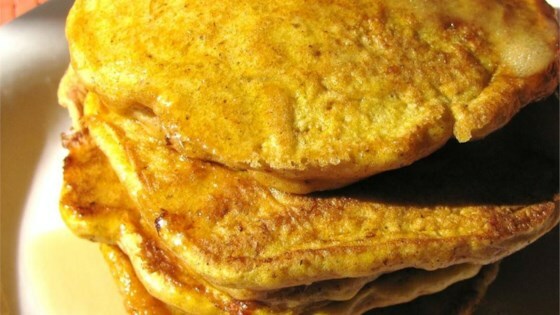 "These pumpkin pancakes are paleo-friendly and seasoned with cloves, ginger, and cinnamon." Mix pumpkin puree, almond milk, eggs, maple syrup, and vanilla extract together in a bowl until smooth. Whisk coconut flour, baking soda, salt, almond meal, cinnamon, ginger, and cloves together in a separate bowl. Stir pumpkin mixture and flour mixture together in a pourable container until well incorporated. Allow batter to sit for 3 minutes. Heat vegetable oil in a skillet over low heat. Pour silver dollar-sized circles of batter into the hot oil. Cook until lightly browned, about 5 minutes per side. These work well with applesauce (organic/unsweetened) instead of pumpkin also. I use coconut oil or another Paleo fat,. Loved this! The pumpkin and spice flavors were delicious. They were not too dense either. Just perfect! These were delicious! my 3 and 6 year old loved them and so did I! I had a few left over the next day and I made an egg sandwich using these pancakes as the bread! yummy! These were suprisingly wonderful. My batter seemed a little thick so I added a bit more almond milk. But everyone in the family loved them! I loved these, and they hold together so well!